Five years ago, then Japanese Prime Minister Noda Yoshihiko effectively nationalised the island chain known as Diaoyu in China and Senkaku in Japan. While Noda purportedly took this action to deescalate relations with China in order to avoid the potentially more provocative purchase of the islands by the nationalist former mayor of Tokyo Ishihara Shintaro, it was a severe miscalculation. High-level diplomacy was suspended for over a year and the backlash against firms on the mainland was intense. Five years on, it is time to assess how these events affected what is Japan’s largest and arguably most important economic partner. 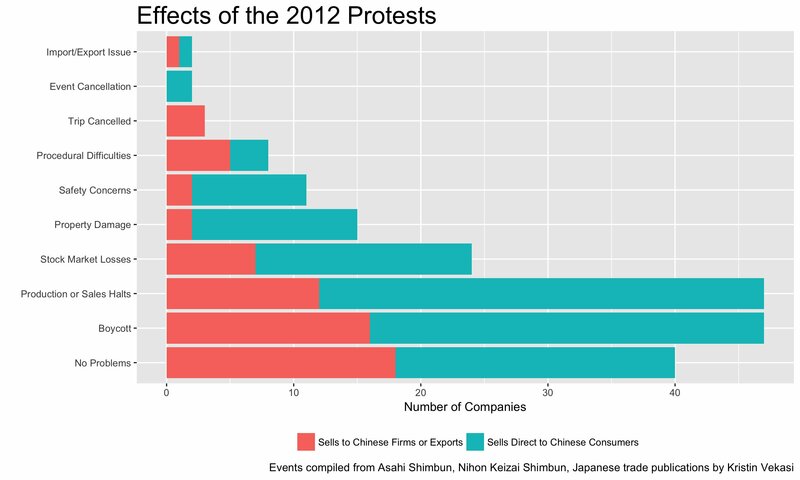 Following the 2012 protests … members of the Japanese business community saw how quickly Chinese consumers turned on Japanese products when the political winds shifted against the country. The linkage between politics and economics on the popular level in China was disturbing for Japanese firms. Surveys in the aftermath of the event revealed deep concern over the future of business relations with China. Consulting firm Teikoku Databank found that 40 percent of firms suffered some negative consequence due to anti-Japanese demonstrations – noting in October 2012 that automobiles, electronics, and “popular stores” had to shut down. Surveys conducted by the Japan External Trade Organisation (JETRO) also revealed pessimism on the part of Japanese firms. Compared to the previous year, there was an unexpectedly sharp drop (14.5 percent) in firms that planned to expand business in China. In their survey of overseas Japanese firms, the Japan Bank of International Cooperation (JBIC) found that 16 percent of firms overall reported negative repercussions from the territorial dispute and 65 percent of automobile makers reported detrimental outcomes. Echoing the results of the JETRO report, the number of firms that felt optimistic about their future in China dropped 30 percentage points compared to the previous survey in 2010. China lost its place as the top-ranked investment destination in the JBIC survey for the first time in decades. A joint survey released by the US-based think tank Centre for Strategic Studies and Japan-based Nikkei showed even more discouraging results for a continued positive business relationship between Japan and China. In 2012, 82.2 percent of Japanese respondents stated that “political risk” posed the greatest risk to doing business in China, and of those 43.7 percent said that the “exclusion of Japanese enterprises and/or Japanese products when Japan-China relations deteriorate” was the most serious problem. In 2014, those numbers remained grim at 80.5 percent and 36.1 percent respectively. Compared to previous political disruptions (such as the 2010 trawler incident or 2005 protests), the 2012 protests indeed caused more disruption in trade and investment flows. The figure below shows trends in Japanese monthly trade with China from 2000-2017. 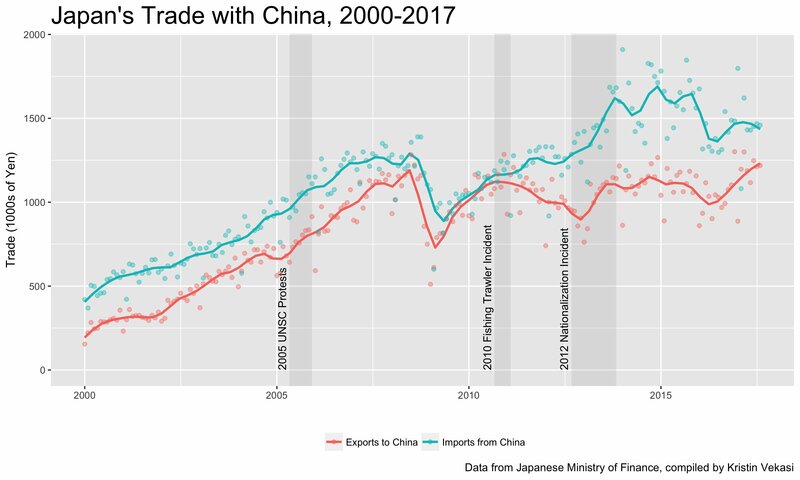 Exports to China, in particular, suffered from the incident, and have only recently shown signs of returning to its previous upward trend line. During the disputes, firms reported that problems with customer relations, product boycotts, sales at the point of production, and the necessity to cancel business trips had an overall poor effect on their capacity to do business. The second figure shows what, if any, problems firms experienced during the dispute. Most common were boycotts and production or sales halts, followed by stock market losses, property damage, and concerns for personal safety. Some firms also reported having difficulty with business procedures, import/export issues, or having their events or business trips cancelled. The most severe effects fell on Japanese firms that relied on selling directly to Chinese consumers. Boycotts and production or sales stoppages particularly affected companies that rely on the goodwill of their Chinese customers to succeed. This background is essential in laying the groundwork for why the events of 2012 still have political economic reverberations today. After the protests in 2005 and 2010, Japanese economic leaders were ready to move past the so-called “cold politics, hot economics” (seirei keinetsu) framework. Political disruptions were seen as temporary problems and, in general, there was a belief that relations were on an upward trajectory. Following the 2012 protests, those attitudes shifted. Members of the Japanese business community saw how quickly Chinese consumers turned on Japanese products when the political winds shifted against the country. Interviews I conducted with Japanese business people reflected this new reality. As China finally made the fundamental shift from “factory of the world” to “market of the world” (sekai no koujou kara sekai no shijou he), its vulnerability to popular protest and anti-foreign sentiment became more important in the assessment of political and economic risk. No longer were long periods of stability predicted. No longer was there strong faith that anti-Japanese sentiment would disappear with the passing of one generation to another. These changes occurred because the anti-Japanese protests were widespread and long-lasting, involved elements of violence, and appeared to have more tacit approval from the Chinese state than prior anti-Japanese actions. The Chinese state did not crack down on anti-Japanese protests as quickly or stridently as they had in the past. The protests were also quite long. It took approximately a year before the two countries returned to typical diplomatic relations, and the incident was only officially shelved after Abe and Xi had their memorably awkward handshake at the 2014 APEC meeting. Five years later, some contend that the issue has been resolved and that economic relations are now back on a positive trajectory, or that firms no longer are concerned about political tensions or risks. Other recent scholarship argues that – even with political interference – we should not expect more than a few months disruption. I am more sceptical. First, when comparing surveys of the business community across time, we do not see substantial improvement. The CSIS/Nikkei survey showed almost 80 percent still reporting political risk as the greatest problem to doing business in China, with a third of those respondents referring specifically to Japan-China relations. JBIC reports on optimism about business opportunities in China, which plummeted from about 70 percent of companies to 40 percent in 2012, remained around 40 percent in 2016. More optimistically, fewer companies reported “social instability” as an issue, a concern that had remained high since 2012. While there have been incremental improvements in the investment outlook, they come nowhere near countering the dramatic plunge in trust post-2012. The bleeding has been staunched, but real recovery has not materialised. Perhaps more importantly, the potential growth sectors for Japanese firms in China – retail, sales, services – are those that are most sensitive to the risks engendered by Sino-Japanese political strife. Chinese consumers have shown themselves willing to punish Japanese firms for their country of origin, a lesson that the Japanese business community has now internalised. Five years out from the protests, Japan and China remain on unsteady economic footing. Given Abe Shinzo’s recent electoral victory and his dedication to constitutional revision however, the relative calm in Sino-Japanese relations may be coming to an end. Japanese firms in China would be wise to prepare for a new wave of politically-inspired backlash. Kristin Vekasi (@ProfVekasi) is an Assistant Professor in the Department of Political Science and School of Policy and International Affairs at the University of Maine. Her research interests focus on international political economy, and the dynamics of political conflict, foreign direct investment, and nationalism. She specialises in Northeast Asia, and has spent years conducting research in both China and Japan. Her current research looks at how Japanese multinational corporations mitigate political risk in China. Image credit: CC by VOA/Wikimedia Commons.